LOS ANGELES — Nov. 20, 2012 — Atari, one of the world’s most recognized publishers and producers of interactive entertainment, along with leading global social network and mobile games publisher 6waves, and game development studio Galaxy Pest Control today announced that the franchise that originated and popularized hunting games has set up camp on Facebook with Deer Hunter Online http://www.facebook.com/pages/Deer-Hunter-Online/300761470027886. Deer Hunter Online sends virtual outdoorsmen into the field, to compete with their Facebook friends to bring home the biggest bucks, rams, and more. A powerful 3D graphics engine will transport users to a variety of immersive wilderness locations, where they can track, stalk and hunt a variety of game animals. A detailed character creation and upgrade system allows users to build their ideal hunter and compete at the highest level. Explore diverse wilderness environments ranging from the snowcapped mountains of Alaska to the desert plains of Arizona. Build wealth and experience to collect a huge array of weapons, ammunition, and accessories. Hunt a variety of animals including deer, elk, moose, caribou, and pronghorn sheep. Collect trophies, achievements and prizes to show off to your friends and develop your hunter. Experience the most realistic hunting action on any web browser (Compatible with Mac and PC). For more information, please log onto www.atari.com or follow Deer Hunter Online on Facebook today http://www.facebook.com/pages/Deer-Hunter-Online/300761470027886. Atari (www.atari.com) is a multi-platform, global interactive entertainment and licensing company. The original innovator of video gaming, founded in 1972, Atari owns and/or manages a portfolio of more than 200 games and franchises, including world renowned brands like Asteroids®, Centipede®, Missile Command®, Pong®, Test Drive®, Backyard Sports®, and Rollercoaster Tycoon®. Atari capitalizes on these powerful properties by delivering compelling games online (i.e. browser, Facebook® and digital download), on smartphones and tablets and other connected devices. The Company also develops and distributes interactive entertainment for video game consoles from Microsoft, Nintendo and Sony. As a licensor, Atari extends its brand and franchises into other media, merchandising and publishing categories. Atari has offices in Los Angeles, San Francisco, New York, Paris, and Lyon. 6waves (6waves.com) is a leading publisher of independent games on social networks and mobile platforms, partnering with developers all over the world to bring the best games to the millions of users in its gaming network. From its original roots on Facebook, the company has now expanded into iOS and Android, Yahoo! Mobage, Mixi and Hangame in Japan, and Tencent in China. Headquartered in Hong Kong with offices in San Francisco, Moscow, Beijing and Tokyo, the team has a uniquely international perspective and has forged successful partnerships with developers from across the globe. 6waves’ investors include Insight Venture Partners and Nexon Co. Ltd. 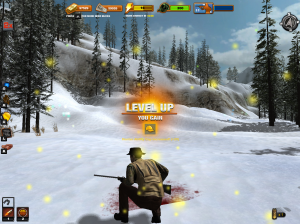 Deer Hunter® Online © 2012 Atari, Inc. All rights reserved. Deer Hunter is a registered trademark, used under license from Glu Mobile Inc. Developed by Galaxy Pest Control. Marketed and distributed by Atari, Inc and 6waves. Atari and the Atari logo are trademarks owned by Atari Interactive, Inc. All other trademarks are the property of their respective owners.